In a figurative sense, a tragedy (from Classical Greek τραγωδία, "song for the goat," see below) is any event with a sad and unfortunate outcome, but the term also applies specifically in Western culture to a form of drama defined by Aristotle, characterized by seriousness and dignity and involving a great person who experiences a reversal of fortune (Peripeteia). (Aristotle's definition can include a change of fortune from bad to good as in the Eumenides, but he says that the change from good to bad as in Oedipus Rex is preferable because this effects pity and fear within an audience.) According to Aristotle, "The structure of the best tragedy should be one that represents for that is peculiar to this form of art." This reversal of fortune must be caused by the tragic hero's hamartia, which is often mistranslated as a character flaw, but is more correctly translated as a mistake (since the original Greek etymology traces back to hamartanein, which is a sporting term that refers to an archer or spear-thrower missing his target). According to Aristotle, "The change to bad fortune which he undergoes in not due to any moral defect or flaw, but a mistake of some kind." It is also a misconception that this reversal can be brought about by a higher power (for example, the law, the gods, fate, or society), but if a character’s downfall is brought about by an external cause, Aristotle describes this as a "misadventure" and not a tragedy. The origins of tragedy in the West are obscure but it is certainly derived from the poetic and religious traditions of ancient Greece. Its roots may be traced more specifically to the dithyrambs, the chants and dances honoring the Greek god Dionysus, later known to the Romans as Bacchus. These drunken ecstatic performances were said to have been created by the satyrs, half-goat beings who surrounded Dionysus in his revelry. Phrynichus, son of Polyphradmon and pupil of Thespis, was one of the earliest of the Greek tragedians, "The honour of introducing Tragedy in its later acceptation was reserved for a scholar of Thespis in 511 B.C.E., Polyphradmon's son, Phrynichus; he dropped the light and ludicrous cast of the original drama and dismissing Bacchus and the Satyrs formed his plays from the more grave and elevated events recorded in mythology and history of his country. ", and some of the ancients regarded him as the real founder of tragedy. He gained his first poetical victory in 511 B.C.E. However, P.W. Buckham writes (quoting August Wilhelm von Schlegel) that Aeschylus was the inventor of tragedy, "Aeschylus is to be considered as the creator of Tragedy: in full panoply she sprung from his head, like Pallas from the head of Jupiter. He clad her with dignity, and gave her an appropriate stage; he was the inventor of scenic pomp, and not only instructed the chorus in singing and dancing, but appeared himself as an actor. He was the first that expanded the dialogue, and set limits to the lyrical part of tragedy, which, however, still occupies too much space in his pieces." Later in ancient Greece, the word "tragedy" meant any serious (not comedy) drama, not merely those with a sad ending. There is some dissent to the dithyrambic origins of tragedy mostly based in the differences between the shapes of their choruses and styles of dancing. A common descent from pre-Hellenic fertility and burial rites has been suggested. Tragedy depicts the downfall of a noble hero or heroine, usually through some combination of hubris, fate, and the will of the gods. The tragic hero's powerful wish to achieve some goal inevitably encounters limits, usually those of human frailty (flaws in reason, hubris, society), the gods (through oracles, prophets, fate), or nature. Aristotle says that the tragic hero should have a flaw or make some mistake (hamartia). The hero need not die at the end, but must undergo a change in fortune. In addition, the tragic hero may achieve some revelation or recognition (anagnorisis—"knowing again" or "knowing back" or "knowing throughout" ) about human fate, destiny, and the will of the gods. Aristotle terms this sort of recognition "a change from ignorance to awareness of a bond of love or hate." Aristotle is very clear in his Poetics that tragedy proceeded from the authors of the Dithyramb. P.W. Buckham writes that the tragedy of the ancients resembled modern operatic performance, and that the lighter sort of Iambic became Comic poets, the graver became Tragic instead of Heroic. 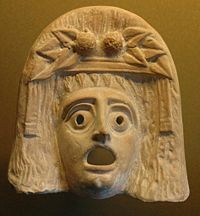 Mask of Dionysus. Greek, Myrina, second century B.C.E. Greek literature boasts three great writers of tragedy whose works are extant: Sophocles, Euripides and Aeschylus. The largest festival for Greek tragedy was the Dionysia, held for five days in March, for which competition prominent playwrights usually submitted three tragedies and one satyr play each. The Roman theater does not appear to have followed the same practice. Seneca adapted Greek stories, such as Phaedra, into Latin plays; however, Senecan tragedy has long been regarded as closet drama, meant to be read rather than played. A favorite theatrical device of many ancient Greek tragedians was the ekkyklêma, a cart hidden behind the scenery which could be rolled out to display the aftermath of some event which had happened out of sight of the audience. This event was frequently a brutal murder of some sort, an act of violence which could not be effectively portrayed visually, but an action of which the other characters must see the effects in order for it to have meaning and emotional resonance. Another reason that the violence happened off stage was that the theatre was considered a holy place, so to kill someone on stage is to kill them in the real world. A prime example of the use of the ekkyklêma is after the murder of Agamemnon in the first play of Aeschylus' Oresteia, when the king's butchered body is wheeled out in a grand display for all to see. Variations on the ekkyklêma are used in tragedies and other forms to this day, as writers still find it a useful and often powerful device for showing the consequences of extreme human actions. Another such device was a crane, the mechane, which served to hoist a god or goddess on stage when they were supposed to arrive flying. This device gave origin to the phrase "deus ex machina" ("god out of a machine"), that is, the surprise intervention of an unforeseen external factor that changes the outcome of an event. Greek tragedies also sometimes included a chorus composed of singers to advance and fill in detail of the plot. Friedrich Nietzsche dedicated his famous early book, The Birth of Tragedy, to a discussion of the origins of Greek tragedy. He traced the evolution of tragedy from early rituals, through the joining of Apollonian and Dionysian forces, until its early "death" in the hands of Socrates. In opposition to Schopenhauer, Nietzsche viewed tragedy as the art form of sensual acceptance of the terrors of reality and rejoicing in these terrors in love of fate (amor fati), and therefore as the antithesis to the Socratic Method, or the belief in the power of reason to unveil any and all of the mysteries of existence. Ironically, Socrates was fond of quoting from tragedies. Greek tragedies were performed in late March/early April at an annual state religious festival in honor of Dionysus. The presentation took the form of a contest between three playwrights, who presented their works on three successive days. Each playwright would prepare a trilogy of tragedies, plus an unrelated concluding comic piece called a satyr play. Often, the three plays featured linked stories, but later writers like Euripides may have presented three unrelated plays. Only one complete trilogy has survived, the Oresteia of Aeschylus. The Greek theater was in the open air, on the side of a hill, and performances of a trilogy and satyr play probably lasted most of the day. Performances were apparently open to all citizens, including women, but evidence is scanty. The theater of Dionysus at Athens probably held around 12,000 people. The presentation of the plays probably resembled modern opera more than what we think of as a "play." All of the choral parts were sung (to flute accompaniment) and some of the actors' answers to the chorus were sung as well. The play as a whole was composed in various verse meters. All actors were male and wore masks, which may have had some amplifying capabilities. A Greek chorus danced as well as sang. (The Greek word choros means "a dance in a ring.") No one knows exactly what sorts of steps the chorus performed as it sang, but choral songs in tragedy are often divided into three sections: strophe ("turning, circling"), antistrophe ("counter-turning, counter-circling") and epode ("after-song"). One possible scenario is that the chorus would dance one way around the orchestra ("dancing-floor") while singing the strophe, turn another way during the antistrophe, and then stand still during the epode. The philosopher Aristotle theorized in his work, The Poetics, that tragedy results in a catharsis (emotional cleansing) of healing for the audience through their experience of these emotions in response to the suffering of the characters in the drama. He considers it superior when a character passes from good fortune to bad rather than the reverse; at the time, the term "tragedy" was not yet fixed solely on stories with unhappy endings. Ἐστὶν οὖν τραγωδία μίμησις πράξεως σπουδαίας καὶ τελείας, μέγεθος ἐχούσης, ἡδυσμένῳ λόγῳ, χωρὶς ἑκάστῳ τῶν εἰδὼν ἐν τοῖς μορίοις, δρώντων καὶ οὐ δι'ἀπαγγελίας, δι' ἐλέου καὶ φόβου περαίνουσα τὴν τῶν τοιούτων παθημάτων κάθαρσιν. Common usage of tragedy refers to any story with a sad ending, whereas to be an Aristotelian tragedy the story fit the set of requirements as laid out by Poetics. By this definition social drama cannot be tragic because the hero in it is a victim of circumstance and incidents which depend upon the society in which he lives and not upon the ineludible inner compulsions—psychological or religious—which determine his progress towards self-knowledge and death. Exactly what constitutes a "tragedy," however, is a frequently debated matter. In ancient India, the writer Bharata Muni in his work on dramatic theory Natya Shastra recognized tragedy in the form of several rasas (emotional responses), such as pity, anger, disgust, and terror. The classical Greek and Roman tragedy was largely forgotten in Western Europe from the Middle Ages to the beginning of sixteenth century, and public theater in this period was dominated by mystery plays, morality plays, farces, miracle plays, and so on. As early as 1503, however, original language versions of Sophocles, Seneca, Euripides, Aristophanes, Terence, and Plautus were all available in Europe and the next forty years would see humanists and poets both translating these classics and adapting them. In the 1540s, the continental university setting (and especially—from 1553 on—the Jesuit colleges) became host to a Neo-Latin theater (in Latin) written by professors. The influence of Seneca was particularly strong in humanist tragedy. His plays—with their ghosts, lyrical passages and rhetorical oratory—brought to many humanist tragedies a concentration on rhetoric and language over dramatic action. Along with their work as translators and adaptors of plays, the humanists also investigated classical theories of dramatic structure, plot, and characterization. Horace was translated in the 1540s, but had been available throughout the Middle Ages. A complete version of Aristotle's Poetics appeared later (first in 1570 in an Italian version), but his ideas had circulated (in an extremely truncated form) as early as the thirteenth century in Hermann the German's Latin translation of Averroes' Arabic gloss, and other translations of the Poetics had appeared in the first half of the sixteenth century; also of importance were the commentaries on Aristotle's poetics by Julius Caesar Scaliger which appeared in the 1560s. The fourth century grammarians Diomedes and Aelius Donatus were also a source of classical theory. The sixteenth century Italians played a central role in the publishing and interpretation of classical dramatic theory, and their works had a major effect on continental theater. Lodovico Castelvetro's Aristotlean Art of PoetryŔ (1570) was one of the first enunciations of the "three unities." Italian theater (like the tragedy of Gian Giorgio Trissino) and debates on decorum (like those provoked by Sperone Speroni's play Canace and Giovanni Battista Giraldi's play Orbecche) would also influence the continental tradition. Humanist writers recommended that tragedy should be in five acts and have three main characters of noble rank; the play should begin in the middle of the action (in medias res), use noble language and not show scenes of horror on the stage. Some writers attempted to link the medieval tradition of morality plays and farces to classical theater, but others rejected this claim and elevated classical tragedy and comedy to a higher dignity. Of greater difficulty for the theorists was the incorporation of Aristotle's notion of "catharsis" or the purgation of emotions with Renaissance theater, which remained profoundly attached to both pleasing the audience and to the rhetorical aim of showing moral examples (exemplum). The precepts of the "three unities" and theatrical decorum would eventually come to dominate French and Italian tragedy in the seventeenth century, while English Renaissance tragedy would follow a path far less indebted to classical theory and more open to dramatic action and the portrayal of tragic events on stage. Among these plays are the so-called "love tragedies," such a Romeo and Juliet and Othello. While Othello hinges on the "fatal flaw" of its eponymous tragic hero, the fault in Romeo and Juliet is equally shared among not only the rashness of its too young lovers, but also the familial and social tension between the Montagues and the Capulets. Another subset of tragedies that were popular in the Elizabethan theater were the revenger tragedy. One of the most famous of these was Hamlet, which combined the notion of the tragic flaw (his inability to act) with the demands of the revenger. Other practitioners of tragedy in the Elizabethan theater include Christopher Marlowe a contemporary of Shakespeare who wrote the Tragedy of Dr. Faustus and Tamburlaine. John Webster (1580?-1635? ), also wrote famous plays of the genre, including The Duchess of Malfi and The White Devil. In France, the most important source for tragic theater was Seneca and the precepts of Horace and Aristotle (and modern commentaries by Julius Caesar Scaliger and Lodovico Castelvetro), although plots were taken from classical authors such as Plutarch, Suetonius, the Bible, from contemporary events and from short story collections (Italian, French and Spanish). The Greek tragic authors (Sophocles, Euripides) would become increasingly important as models by the middle of the seventeenth century. Important models for both comedy, tragedy and tragicomedy of the century were also supplied by the Spanish playwrights Pedro Calderón de la Barca, Tirso de Molina, and Lope de Vega, many of whose works were translated and adapted for the French stage. Racine's tragedies—inspired by Greek myths, Euripides, Sophocles and Seneca—condensed their plot into a tight set of passionate and duty-bound conflicts between a small group of noble characters, and concentrated on these characters' double-binds and the geometry of their unfulfilled desires and hatreds. Racine's poetic skill was in the representation of pathos and amorous passion (like Phèdre's love for her stepson) and his impact was such that emotional crisis would be the dominant mode of tragedy to the end of the century. Racine's two late plays ("Esther" and "Athalie") opened new doors to biblical subject matter and to the use of theater in the education of young women. Racine also faced criticism for his irregularities: when his play, Bérénice, was criticized for not containing any deaths, Racine disputed the conventional view of tragedy. In modernist literature, the definition of tragedy has become less precise. The most fundamental change has been the rejection of Aristotle's dictum that true tragedy can only depict those with power and high status. Arthur Miller's essay Tragedy and the Common Man exemplifies the modern belief that tragedy may also depict ordinary people in domestic surroundings. British playwright Howard Barker has argued strenuously for the rebirth of tragedy in the contemporary theater, most notably in his volume Arguments for a Theatre. "You emerge from tragedy equipped against lies. After the musical, you're anybody's fool," he observes. A Doll's House (1879) by the Norwegian playwright Henrik Ibsen, which depicts the breakdown of a middle-class marriage, is an example of a more contemporary tragedy. Like Ibsen's other dramatic works, it has been translated into English and has enjoyed great popularity on the English and American stage. Although the most important American playwrights—Eugene O'Neill, Tennessee Williams and Arthur Miller—wrote tragedies, the rarity of tragedy in the American theater may be owing in part to a certain form of idealism, often associated with Americans, that man is captain of his fate, a notion exemplified in the plays of Clyde Fitch and George S. Kaufmann. Arthur Miller, however, was a successful writer of American tragic plays, among them The Crucible, All My Sons, and Death of a Salesman. Contemporary postmodern theater moves the ground for the execution of tragedy from the hamartia (the tragic mistake or error) of the individual tragic hero to the tragic hero's inability to have agency over his own life, without even the free will to make mistakes. The fate decreed from the gods of classical Greek tragedy is replaced by the will of institutions that shape the fate of the individual through policies and practices. Tragedy often shows the lack of escape of the protagonist, whereby he or she cannot remove himself from the present environment. The word's origin is Greek tragōidiā (Classical Greek τραγωδία) contracted from trag(o)-aoidiā = "goat song" from tragos = "goat" and aeidein = "to sing." This meaning may have referred to horse or goat costumes worn by actors who played the satyrs, or a goat being presented as a prize at a song contest and in both cases the reference would have been the respect for Dionysos. Old-English spellings such as tragoedy (cf. Latin tragoedia) and tragedie (cf. French tragédie) occur in early-modern and earlier works. ↑ Aristotle. Poetics, trans. W.H. Fyfe (Cambridge: Harvard University Press, 1932). ↑ Amelie Oksenberg Rorty, Essays on Aristotle’s Poetics (Princeton: Princeton University Press, 1992), 178. ↑ Aristotle, Poetics, Section 1135b. ↑ P.W. Buckham, Theatre of the Greeks, 108. ↑ Aristotle, Poetics, IV, 1449a. ↑ 8.0 8.1 P.W. Buckham, 243. ↑ J. Chiari, Landmarks of Contemporary Drama (London: Jenkins, 1965), 41. ↑ Howard Barker, Arguments for a Theatre (London: John Calder, 1989), 13. Buckham, P.W. Theatre of the Greeks. 1827. Gregory, Justina. A Companion to Greek Tragedy. 2005. Schlegel, August Wilhelm von. Lectures on Dramatic Art and Literature. 1809. Symonds, J.A. Studies of the Greek Poets. 1873. This page was last modified on 10 November 2008, at 15:00.